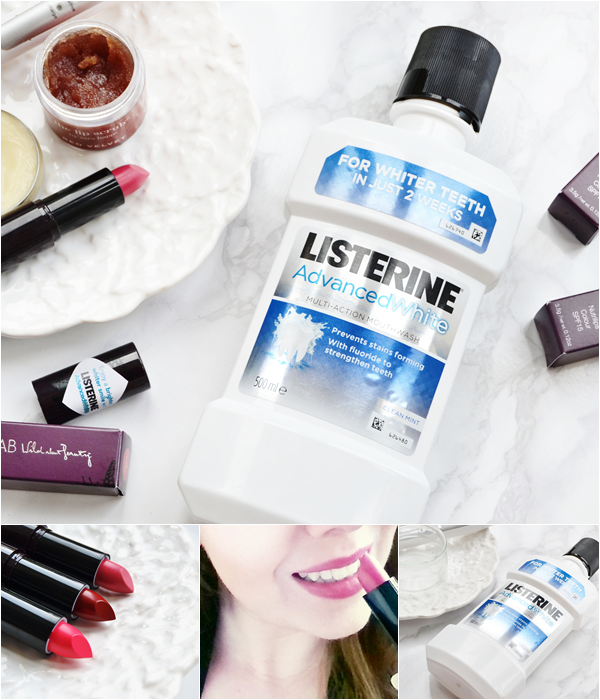 A Whiter Smile with Listerine Advanced White + Giveaway! 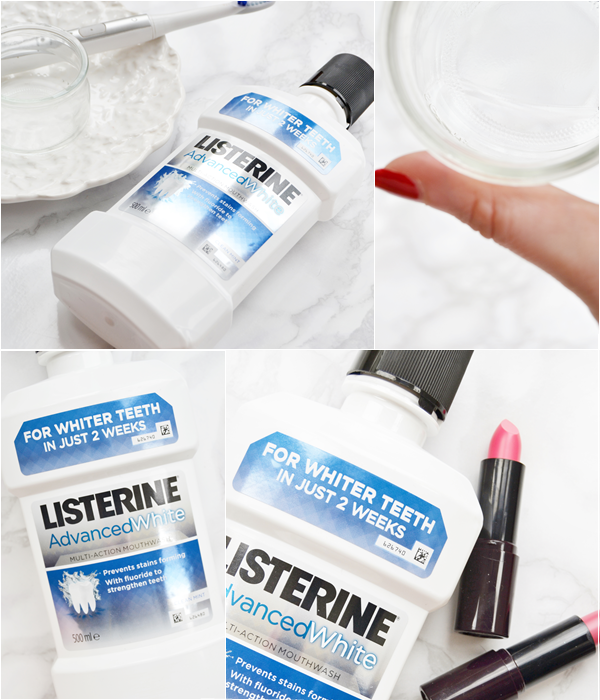 Today I wanted to talk teeth, as Listerine are launching Listerine Advanced White multi-action mouthwash in August and I think we are all after that brighter whiter smile! I'll be honest... I don't like my teeth, or I should say, I didn't like my teeth. I opted to not have braces in my teens and as a result I don't have the straightest teeth! However without going down the expensive route of cosmetic dentistry something that does make me a lot more confident with smiling is having a white smile. Along with good oral hygiene, the new Listerine Advanced White mouthwash is clinically proven to give whiter teeth in just 2 weeks whilst also preventing stains from forming. Pretty great if you ask me! 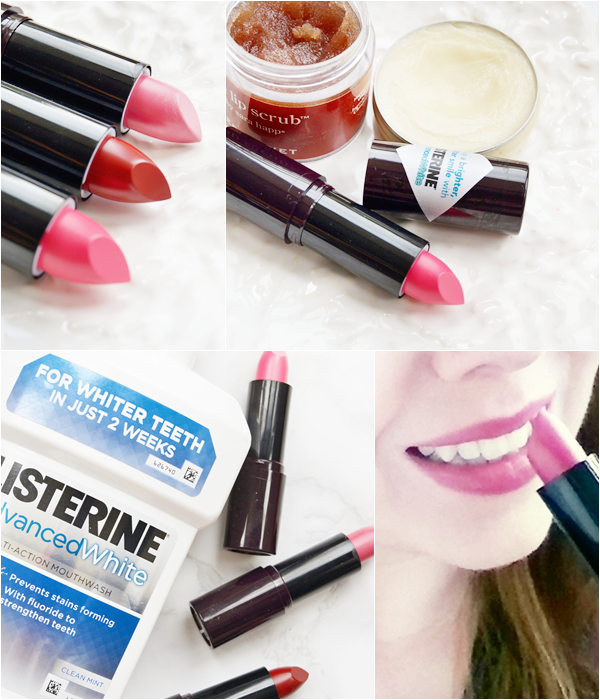 Listerine have also teamed up with beauty expert and co-owner of Wild About Beauty makeup, Louise Redknapp to select lipstick shades from her brand that make teeth look even whiter. A few of which I have to giveaway (details at the bottom of this post on how to enter) with a bottle of the new Listerine mouthwash! When it comes to my beauty/teeth routine I first brush my teeth with a fluoride toothpaste and my sonic toothbrush for 2 minutes. Manual toothbrushes have been proven to be as effective but I love how sonic electric toothbrushes feel! I then finish off with the latest addition to my beauty routine, Listerine Advanced White mouthwash, to help me achieve a whiter smile! The mouthwash also contains fluoride to strengthen teeth and essential oils to freshen the breath. Side note – The recommended amount to use, as stated on the bottle, is 10ml or 2 x5ml teaspoons and as you can see above it is quite a small amount - but that is enough to coat the teeth, making them whiter! Of course lips also have a part to play in a powerful smile so I like to keep them smooth with a good lip scrub and use lipsticks that generally have cool undertones to help my teeth look whiter and compliment my fair skin tone. Louise Redknapp, co-owner of Wild About Beauty has selected 3 shades from her makeup range that are great for helping the teeth to appear whiter. All the shades can be seen above. “This wearable soft pink is the perfect sheer shade to compliment any make-up look. It has cooler pink undertones, to minimise yellow tinges in teeth and helps them look naturally radiant while brightening your smile,” says Louise. “This statement fuchsia pink hue creates a dramatic contrast thanks to its blue undertones, which help frame the mouth and make the whiteness of teeth really stand out. When choosing pinks, always opt for cooler undertones and avoid shades with yellow or orange undertones as they tend to accentuate the yellow in teeth.” says Louise. “Deep colours work wonders as they reflect off your smile to really boost brightness and whiteness. If you’re looking for a dark colour, always go for a rich berry with cool undertones, over a brown as brown hues can bring out an unwanted yellow appearance in teeth,” says Louise. To win one of the stunning Wild About Beauty lipsticks (worth £15) and a coupon to redeem against one bottle of LISTERINE® Advanced White 500ml or 1L, simply tweet me (@makeup_savvy) your powerful smiling picture along with the hashtag #PowerfulSmiles. Only one entry per person. UK only. Closing date - 18th August 2015. You can find the full terms and conditions of the prize draw here. Listerine Advanced White will be available nationwide from August 2015 in supermarkets and pharmacies and will be priced at 500ml £5.49, 1litre £9.49 RRP. * Listerine provided the product and sponsored the post as part of their marketing communications for the launch of Listerine Advanced White.